What do you call a guy whose equipment set-up includes a TR-808, TR-909, TR-727, TB-303, MC-202, two SH-101s, a Jupiter 8 and a Juno 106? Answer: Gerald. WHAT do you call that guy if he's thinking of adding an R-8M, an S-770 and a D-550 to that set-up? Answer: A Roland addict. 22-year-old Gerald Simpson, aka A Guy Called Gerald, happily confesses his addiction, which began in 1983, when a shop assistant in Al Music, Manchester, asked him if he'd like to try Drumatix. Instantly hooked, Gerald spent all his money in the shop. His world revolved around Roland gear to such an extent that he even indulged during working hours. 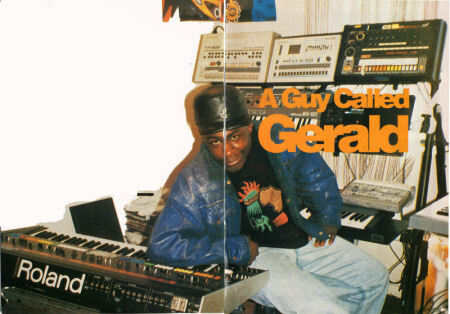 Gerald was a DJ in youth clubs around Manchester. Long before they became the darlings of the Dance scene, he took his TB-303 Bassline and TR-606 to play along with the records, and to give him a competitive edge at sound system 'clashes', where he would pro-gram a bassline off a record into the 303 and play it along with the record, syncing the two together manually. "It'd be going along with the tune, but there'd be a totally different sound, and the other system would be thinking 'We've got that record but it doesn't sound like that, it must be a different version'." By 1985 he'd moved on to the TR-808. "There were quite a few other drum machines around at the time, but I wanted something with a bit of oomph in it, and when I heard the 808 I knew that was the one for me. I'd already heard it on a lot of Soul tracks and Arthur Baker used it on all those old Electro records, but I hadn't known what it was. When I finally got one I was dead chuffed." Subsequently he bought a couple of SH-101 monosynths and experimented with marrying recorded music from his turntables with synths, sequencers and drum machines. Encouraged by the ease of programming the SH-101, he developed a penchant for sound synthesis. In time the instruments took over from the turntables, and he began to produce original Dance tracks. "I would have the two SH-101s controlled from the accent and cowbell triggers on the 808 so that the rhythms of the 101's sequences could be controlled from the 808. I'd put a bass pattern into one SH-101 sequencer, press Play on the 808 and see what came out; if it sounded good I'd use it, if not then I'd edit it around till I had a really good riff. Then I'd build a drum pattern on the 808 around that. The 808 would be synced to the 303 using the built in DIN sync; I'd put a riff together on the 303 then lay down another riff using the other SH-101. That's how I did tracks like Voodoo Ray." Life changed dramatically when an independent record label, hearing some of his music on local Piccadilly Radio, signed him in 1988 to record the Voodoo Ray EP, which has been followed by two albums, Hot Lemonade and Automanikk. His Roland habit grew with his success. "In 1988 I got a TR-707, MC-202 and Juno 106, and added the Jupiter 8, TR-909 and an MPU-101 MIDI-to-CV converter a year later. I still use the SH-101 for bass sounds, because there's so much you can get out of it. I used the Juno 106 for bass on quite a few tracks on Automanikk and on tour earlier this year; it's a lot smoother, not as rough-edged as the 101. You can get a really warm bass sound if you put it through the Chorus 2 setting." However, with the release of the new album, and live and PA tours, there is little time to check out new gear, and more frustrating, little time for writing new music. "Really I'm more a composer than a per-former: I'd rather compose all the time. If I'm out doing an inter-view and I get an idea for a track I suddenly can't wait to get home and work on it. I could do with a portable sequencer with a built-in synth and drum machine so that when I get an idea I can work on it there, then take it home and load it into another sequencer." That sounds very much like a pocket studio (And that sounds very much like an MV-30 - Ed); Gerald is beginning to rationalise his equipment needs. Without sacrificing his love of experimentation and sound synthesis he now opts for rackmount units for convenience; and he uses modern sampling technology while he's on the road to recreate the sounds he gets at home from the older gear. The basis of his rhythm tracks still comes from the 808, 909 and 727, but these days the sounds are sampled. Particularly impressed by the RGB colour monitor option on Roland samplers Gerald is thinking of upgrading his current Akai MPC60 to the new rackmount S-770; his craving for Roland rhythm technology also extends to the rackmount R-8M Human Rhythm Composer. And his next choice of synth: "One of the LA synths, probably a rackmount for convenience". What do you call a Roland addict? Well this one's A Guy Called Gerald. Who is this guy who calls himself A Guy Called Gerald? What is a 'Voodoo Ray'? Why can't you drink 'Hot Lemonade'? To find the answers to these questions and many more, I got in touch with the man himself, twenty-two year old house music maestro Gerald. "I like the anonymity of not using my surname. I also like the idea of confusing lots of people all over the country." Says Mancunian Gerald. Can you imagine the fuss and bother it must have caused when hip punters all around England, Scotland, Ireland and Wales decided to go out and buy Gerald's record? Hip punter: "Hello, I'd like a record by A Guy Called Gerald." Shop assistant: "Any Gerald in particular?" Hip punter: "Yes, A Guy Called Gerald." Shop assistant: "I'm afraid I'm going to need a bit more information than that." Hip punter: "Look under 'Voodoo Ray' will you." Shop assistant: "Who's he, some-one out of Black Sabbath or the Cult or something?" Hip punter: "Look I'll just have 'Hot Lemonade' if you don't mind." Shop assistant: "I'm sorry but this is a record shop, not a cafe." See what I mean? For those of you who are still confused, 'Voodoo Ray' is the name of a single by an artist calling himself A Guy Called Gerald and 'Hot Lemonade' is the name of his album. 'Voodoo Ray' is so called, because it's a bewitching tune, of course. And 'Hot Lemonade'? Over to Gerald again. "You know when you leave a glass of lemonade lying out in the sun and you go back to it after a couple of hours and you pick it up, thinking it's going to taste alright, then you sip it and . . . YUCK. Well, I thought straight away after I'd finished the album, that it would be a great name." He laughs. That's not a very good plug for yourself is it? "No, but it doesn't matter people are still buying the album." A year after, Gerald's 'Voodoo Ray' E.P. was a smash hit in the clubs, it received almost non stop airplay, and hey presto, it had a second life and bounded straight into the top 20. But despite his success, Gerald isn't as rich as you'd expect him to be. In fact he still has to walk or ride on buses to get to his gigs. "The guy who owns the record label that 'Voodoo Ray' is on can't be bothered to pay me. He's paid everyone else on the label for their work, but it's like he's taken exception to me personally. I want you to print his name, he's called Peter Ley and the record label is called Rham." In fact, things are so bad for Gerald, that on the day of this interview he had to pack all his belongings, including his musical hardware and move back into his mother's house because his land-lord boarded up his flat, after he failed to pay the rent. "It's really bad," complains Gerald "I've just decorated the place with my girlfriend and now we have to move. Of course I understand that my landlord has every right to chuck us out, but it's still very hard on us and embarrassing all the same. This Peter Ley guy has the nerve to call my managers, Terry Hollingsworth and Jerry Hempstead rip off merchants. He hasn't even paid them for the promotion work they did for 'Voodoo Ray', it's a really shoddy way to treat people. I'd set my heart on all this wonderful new equipment with the royalties from the record, but as it is I've got to stay with the little I have got. It's all quite low-budget, my set up, but it's worked for me. With the 'Voodoo Ray' E.P. I really needed a BPM (Beat Per Minute) Counter because the tempo fluctuates from 119 -120 bpms; it's only one beat, but it's enough to piss some djs off." Gerald says that he now has little more than he started off with, which is a little more than the bare essentials. "I started making music for myself when I was about 16 or 17 years old. I saved up and bought a Roland 303 Bassline and a 606 Drum machine. Then I decided I wanted to do full tracks that people could dance to, so I got myself a SH-101 Keyboard (the one I used on 'Voodoo Ray' in fact), and an 808 drum machine." "I borrowed a sampler, an S9-50 Akai from a group called Chapter, who are also on Rham Records." "Before the guys from Chapter taught me what to do with a sampler I didn't have a clue. When they showed me that you could simple things backwards on it, it just blew me, and I had to incorporate that into my sound straight away." "On 'Voodoo' you can hear a girl called Nicola singing. We into a studio in Manchester called Johnny Roadhouse and she sang everything normally and I put her voice into the S9-50 and reversed it. "On 'Rhapsody In Acid', I've sampled some Tibetan Monks chanting and used their voices for the basis of the song. The sequencer I use is the ASQ-10". Gerald first started recording tracks at his mother's house after school. Local groups such as the Ruthless Rap Assassins, Nicola and the Scratch Beat Masters used to turn up on his doorstep and disturb Gerald's parents and the neighbours until the wee small hours. "I think my mother was quite relieved when I left," chuckles Gerald, "the poor woman's going to have to cope with me all over again." As well as his work for Rham records, Gerald has recorded a soundtrack for a book (yes, you read right) which is out on CBS Records. "The soundtrack is four tracks long and the book's called 'Trip City' by Trevor Miller." A four track long soundtrack? Either these tracks are very long, or the books very short, which one is it? "The tracks are normal 12" mix length and the book is your normal paperback size, you can choose whether you want to just set the scene with the soundtrack or keep rewinding it and playing it while you read. I'm really happy with the way the soundtrack turned out, CBS put up the money for the studio time, and did things the way they were meant to be. It was a breath of fresh air after having so many problems." Amongst other people, Gerald has had problems with another Manchester group called 808 State (after the drum machine), who he claims tried to rip him off. However he got his own back after they phoned him and gave him some verbal abuse. "I've recorded everything they said, and I'm going to put it to music and release it as a track, and call it 'So You Wanna Hear 808 State'. I don't think they'll be as popular as they are now when people hear what they say in unguarded moments. I'm releasing the track to teach them a lesson and as a warning to other people who fancy taking me for a ride. This experience with Peter Ley and Rham Records has really toughened me."